Description: Shoulder tattoo design in Polynesian style with turtle patterns and geometrical shapes. I'm Mark Storm, a graphic tattoo artist and I'm specialized in tribal tattoos, inspired by the maori kirituhi style. I recently started this blog as an addition to my custom tattoo blog. Each of the designs you see on my blogs is handdrawn by myself and scanned in high resolution. 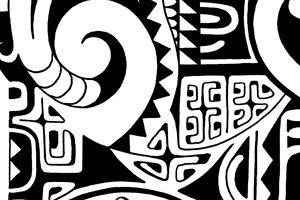 The tattoo drawings I create have NO specific meaning or symbolism, but are esthetic combinations of tribal elements in a Neo-tribalism style. I focus on high quality tattoo flash, not on mass production, that's why you'll not find thousands of flash images, but only a selection of the best sketches and drawings. For now there's only a small number of tattoos, but each week I'll post a new flash design, that you can order right here. So please subscribe if you wish. Any questions? Please let me know. Copyright Tribal tattoo flash designs 2010. Design by Storm3d .